The idea of the logic programming-based approach to the intelligent visual surveillance is in usage of logical rules for description and analysis of people behavior. New prospects in logic programming of the intelligent visual surveillance are connected with the usage of 3D machine vision methods and adaptation of the multi-agent approach to the intelligent visual surveillance. The main advantage of usage of 3D vision instead of the conventional 2D vision is that the first one can provide essentially more complete information about the video scene. The availability of exact information about the coordinates of the parts of the body and scene geometry provided by means of 3D vision is a key to the automation of behavior analysis, recognition, and understanding. 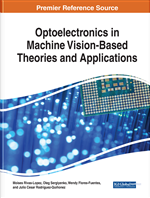 This chapter supplies the first systematic and complete description of the method of object-oriented logic programming of the intelligent visual surveillance, special software implementing this method, and new trends in the research area linked with the usage of novel 3D data acquisition equipment. One can easily incorporate domain knowledge into the recognition process in the form of logical formulae. Reasoning about the behavior of people can be very difficult, but for the developer of the system of the intelligent visual surveillance, it always remains fundamentally understandable. One can easily define a complex activity in terms of simpler activities. In this chapter, research software for logic programming of the intelligent visual surveillance systems is discussed and examples of logic programs for video analysis are represented. The software is based on the Actor Prolog concurrent object-oriented logic language and a state-of-the-art Prolog-to-Java translator. Built-in classes of the Actor Prolog logic programming system are implemented in Java. The low-level stage of the video processing is implemented in special built-in classes of Actor Prolog. The purpose of the software developed is to facilitate research in the area of intelligent video monitoring especially for the evaluation of anomalous people activity and the study of logical description and analysis of people behavior. The open source library of the built-in classes is published in GitHub (Morozov, 2018). A promising approach to implement the logic programming in the video analysis is the translation from the concurrent object-oriented logic language to Java. The means of the object-oriented logic programming enable fast and effective processing big arrays of video data because the arrays of data can be encapsulated in the instances of specialized built-in classes in the object-oriented logic language. The Actor Prolog logic programming system is suitable for this purpose since it is fast enough for the real-time video processing and ensures essential separation of the recognition process into concurrent sub-processes implementing different stages of the high-level video analysis. Generation of Java intermediate code ensures platform independence of the application software and guarantees absence of errors, such as the difficult-to-locate bugs (for instance, caused by memory leaks) and the out-of-range array operations.